Williamsburg Oil Paints, Cadmium colours. Aren't they gorgeous? In the previous articles in this series, I have stepped through how we perceive colour in terms of the variables of lightness (tone/value), hue (colour), and chroma (saturation), and the implications they have for painting. Using my simplified and naive model of the painting process, we analyse the motif in those terms, and construct a mental image of what we intend to convert into our painting, as a representation and personal interpretation of that mental image. The materials which we work with to realise our painting are paints, which consist of the binding medium and pigments, plus various other additives which the paint manufacturer and we might wish to augment the paint. The latter might include surfactants (added by the manufacturer to improve the ‘wetting’ of pigment by medium, and of particles of medium), driers to accelerate the chemical processes by which the medium turns into a polymer, solvents and other substances to improve paint flow and spread, and much more. Before considering the central matter of pigments, I would like to make a couple of important points about the binding medium. There are a lot of misconceptions about what the binder does. In some paints, notably oils and acrylics, the binder is a liquid which, when applied to the ground and exposed to air, forms chemical cross-links to change into a solid polymer, a plastic. I describe the processes involved in the drying of conventional oil paints here. Pigment particles in those paints are surrounded by binder, and end up embedded in its polymer, which provides a good degree of mechanical and chemical protection. Provided that the polymer formed is colourless and allows the passage of light, the paint layer will enable stable dispersal of pigment particles. Of course if the polymer changes colour, as some drying oils are apt to do, then that colour change will modify the perceived colour of that paint layer. Choosing a medium which does not change colour significantly is therefore very important, and the tendency of many oil paints to yellow with age is a constant concern. Other paints are not usually applied as thickly, and have less binder, which then functions to adhere the pigment particles to the ground, as in traditional ‘transparent’ watercolour. These paints do not contain much gum arabic, which is in any case quite different from drying oils or acrylic medium and does not form a polymer layer; instead the gum arabic acts as an adhesive, causing pigment particles to adhere to the paper or other ground, and to one another. There is thus no real paint layer, as such. This may be different with Golden’s QoR watercolours, which do not use gum arabic as a binder, but the synthetic polymer glue Aquazol. When painted out into wash, the Aquazol may act as an adhesive, but is strong enough to form a paint layer when applied more thickly. Almost all paints rely on pigments rather than dyes, although some inks do use dyes (and are often fugitive to light as a result). Dyes are normally dissolved, or at most exist as very small particles, within the medium, and when they become fixed to a ground for permanence they either permeate the superficial layers of the ground or bond chemically to it. Classical examples are fabric dyes. Although some have high levels of lightfastness, dyes are generally less permanent over long periods. When dyes are mixed together, they may react chemically with one another, and the resulting colour is not readily predictable. Pigments consist of larger particles, in which the pigment itself may be bonded to or within other substances, and are suspended in the medium rather than dissolved. This enables more lightfast chemicals to be used, puts them into more protective particles which may also render them less toxic (cadmium salts, for example), and results in paints which handle better and form stronger layers. Mixing paints containing different pigments results in more predictable colours, as the particles normally do not react with one another. Colorants, both pigments and dyes, work by absorbing visible light of certain wavelengths (hue), and reflecting or transmitting all other visible wavelengths. A pure neutral black (zero lightness) absorbs all visible light which falls on it, and does not reflect or transmit any light within the visible spectrum, making it completely opaque. A true neutral white (maximum lightness, but neither hue nor chroma) reflects or transmits all visible light which falls on it. The proportion which is reflected rather than transmitted then determines its opacity; the more that is transmitted, the less opaque it is. Pigments with hue and chroma, which thus appear chromatic or coloured, absorb greater visible light at certain wavelengths, and those determine the colour (hue) that we perceive. For example a cadmium yellow pigment such as cadmium zinc sulphide, PY 35, absorbs blue light, and reflects red and green light, which we perceive as appearing yellow. Mix pigments together, and you will see the result using subtractive colour rules. Add some ultramarine blue, containing sodium aluminium sulphosilicate or PB 29, which absorbs yellow light, and most reflected light from the mixture will be perceived as green. This is because under the subtractive colour mixing rule, yellow plus blue gives green. It may appear odd that mixing a pigment which absorbs blue light but appears yellow, with one that absorbs yellow light but appears blue, results in green reflected light, but complementary colour effects are the rule for colorants. Paints, and the pigments within them, are best known by popular names, such as French Ultramarine. Most also have chemical descriptions, in this case complex sodium aluminium silicate containing sulphur, and should have a Colour Index (CI) name, here PB 29, and a Colour Index number, 77007. Because the CI number is not memorable, most manufacturers give the CI name to indicate which pigments are used in each paint. I have already mentioned the conventional use of the term hue to indicate a paint named after a particular pigment (or pigment combination) but which actually uses different pigment(s) to simulate the colour. Some paints use the term lake, which may not be in its strict meaning. In strict usage, a lake should refer to a pigment derived from fugitive natural dyes, such as a madder extracted from the root of the madder plant Rubia tinctorum, by a chemical process involving their precipitation from solution by a stabiliser, typically a metal salt. In 1804 the British dye maker George Field developed a process involving alum and alkali which resulted in the less fugitive version of madder, which was then termed madder lake (NR 9). French chemists Pierre-Jean Robiquet and Colin then identified its key constituents as alizarin and purpurin, since which madder lake was replaced by the more lightfast alizarin crimson (PR 83). However even that is insufficiently lightfast for serious use, and most recently has been replaced by wholly synthetic pigments such as pyrroles (PR 264) and quinacridones (PR 206), which could therefore be termed alizarin crimson hue. Most pigments are chemically quite stable compounds, and when protected within their particles and again within the polymerised medium forming the paint layer, they should not change colour. However all paints change colour to some degree. The best pigments and paints show imperceptibly small colour shifts during the drying process. These are usually not noticeable in good oil paints, may be large enough to be noticed in watercolours and gouache, and are often largest in acrylics. Thankfully colour shifts, when they do occur, occur soon in the drying process, and can therefore be allowed for or corrected. A few pigments still in use are not as chemically stable. Some may react with atmospheric pollutants such as sulphur dioxide to form sulphides which have different colour, whilst others, as a result of prolonged exposure to light, particularly more reactive ultra-violet light, may change colour or fade by reduction in chroma. Many well-known paintings have suffered marked changes in colour because of the fugitive pigments which have been used. Edward Hopper’s Cape Code Evening (1939) – seen here – is a recent painting which has changed totally as a result of the painter’s failure to use lightfast colours. It now appears eerie with its unnaturally blue trees, but they were originally as green as the dress worn by the woman standing in front of the window. However the green which he used to paint the trees included a fugitive yellow lake pigment, which lost chroma quickly, leaving the trees looking dark blue. Given that the fugitive nature of yellow lakes had been recognised and studied in the nineteenth century, it is puzzling that he should have even purchased a yellow lake, let alone used it here. For all but the most recently introduced pigments, their lightfastness is well understood and has been tested using standard procedures such as the Blue Wool Scale (BWS) method. You should never consider using a paint from any manufacturer, however reputable, unless they identify which pigments are in the paint, and how lightfast the paint is as a result. For some paints there are ASTM standards against which they should be tested, or the manufacturer should give details of an equivalent method and the results. Using a paint whose pigments are unspecified, or whose permanence is untested, is courting disaster. You should also check individual batches of paint from any manufacturer, as they do change pigment formulations on occasion, and that may affect the lightfastness rating. Lightfastness tests on wax crayons, which showed how fugitive some colours are. The areas on the right of the black line were exposed to daylight, those on the left were kept in the dark. You are also wise if you perform your own lightfastness tests. These are not difficult to do, and are described in Gottsegen’s The Painter’s Handbook. Bruce MacEvoy’s Handprint website documents the hundreds of tests which he performed, and is well worth studying. Although you can predict in general terms the hue perceived as resulting from mixing paints of different hues, the only way in which you can determine the exact lightness, hue and chroma of any given mixture is to try it out. 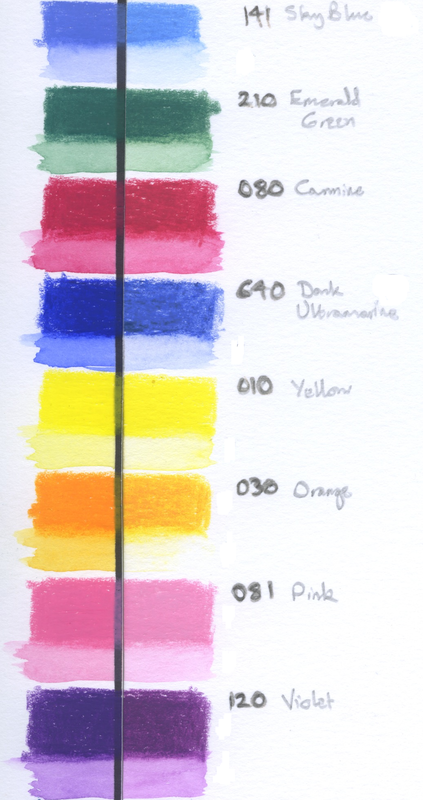 Recommendations for preparing sets of colour mixing charts such as those described by Richard Schmid are thus very valuable, if not essential if you are to have insight into how to use the paints in your palette. I have already explained how mixing pigments can only result in reduction in chroma; because pigments never produce completely pure hues, mixtures tend to reduce lightness and turn a muddy grey. The more pigments in the mixture, and the weaker their individual chroma levels, the fewer pigments are required in combination for this to become noticeable. Accordingly it is best practice to start with paints containing only one or at most two pigments of high chroma, as they will enable the widest range of results from mixtures before chroma collapses. This is particularly relevant to greens, especially for landscape painting: several of the standard green paints in most product ranges start off with more than two pigments, and will quickly turn muddy when you mix them with other paints. However unless you choose blue and yellow paints which use single pigments, your own mixed greens may be no better. Handprint on watercolours, pigments, and colour. Bruce MacEvoy’s superb reference and tutorial information on colour includes clear details about how pigments work, and the rest of his site is a mine of useful information about pigments in watercolour paints. Vol 1, Feller RL ed. (1986) – covers Indian Yellow, Cobalt Yellow, Barium Sulphate, Cadmium Yellows/Oranges/Reds, Red Lead and Minium, Green Earth, Zinc White, Chrome Yellow, Lead Antimonate Yellow, Carmine – ISBN 978 1 904 982 74 6. Vol 2, Roy A ed. (1993) – covers Azurite and Blue Verditer, Ultramarine Blue, Lead White, Lead-Tin Yellow, Smalt, Verdigris and Copper Resinate, Vermilion and Cinnabar, Malachite and Green Verditer, Calcium Carbonate Whites – ISBN 978 1 904982 75 3. Vol 3, Fitzhugh EW ed. (1997) – covers Egyptian Blue, Orpiment and Realgar, Indigo and Woad, Madder and Alizarin, Gamboge, Vandyke Brown, Prussian Blue, Emerald Green and Scheele’s Green, Chromium Oxide Greens, Titanium Dioxide Whites – ISBN 978 1 904982 76 0. Vol 4, Berrie BH ed. (2007) – covers Pigments based on Carbon, Iron Oxides, Asphalt, Cobalt Blue, Arylide (Hansa) Yellow – ISBN 978 1 904982 23 4. This is a remarkable series, published by the National Gallery of Art, Washington, and Archetype. Although expensive and hard to find, they are worth every penny. Posted in Painting and tagged alizarin, ASTM, Blue Wool Scale, colour, colour cognition, colour mixing, colour science, colour terms, colour theory, dyes, fugitive, Hopper, hue, lake, lightfast, madder, painting, permanence, pigments, Richard Schmid, subtractive colour. Bookmark the permalink.